The Encyclopedia of DNA Elements (ENCODE) project, an international collaboration of more than 440 scientists in 32 labs in United States, the United Kingdom, Spain, Singapore and Japan, has announced the results of a five-year study of the regulation and organization of the human genome. The results have been published in one main integrative paper and five other papers in the journalNature, 18 papers in Genome Research, six papers in Genome Biology and a series of reviews in theJournal of Biological Chemistry. “The ENCODE project not only generated an enormous body of data about our genome, but it also analyzed many issues to better understand how the genome functions in different types of cells. These insights from integrative analyses are really stories about how molecular machines interact with each other and work on DNA to produce the proteins and RNAs needed for each cell to function within our bodies,” said Dr Ross Hardison of Pennsylvania State University, a co-author of reviews in the Journal of Biological Chemistry. “The Journal of Biological Chemistry recognized that the results from the ENCODE project also would catalyze much new research from biochemists and molecular biologists around the world. Hence, the journal commissioned these articles not only to communicate the insights from the papers now being published but also to stimulate more research in the broader community,” he said. The human genome consists of about 3 billion DNA base pairs, but only a small percentage of DNA actually codes for proteins. The roles and functions of the remaining genetic information were unclear to scientists and even referred to as ‘junk DNA.’ But the results of the ENCODE project is filling this knowledge gap. 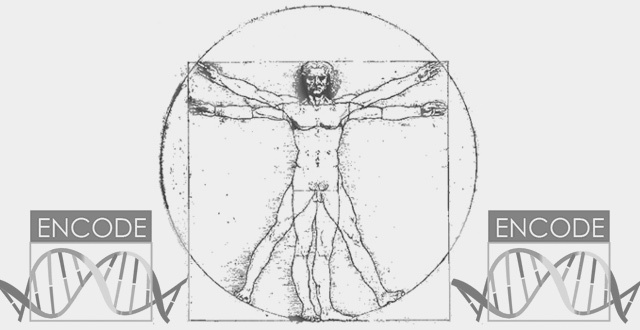 The findings revealed that more than 80 percent of the human genome is associated with biological function. The study showed in a comprehensive way that proteins switch genes on and off regularly – and can do so at distances far from the genes they regulate – and it determined sites on chromosomes that interact, the locations where chemical modifications to DNA can influence gene expression, and how the functional forms of RNA can regulate the expression of genetic information. The results establish the ways in which genetic information is controlled and expressed in specific cell types and distinguish particular regulatory regions that may contribute to diseases. The story of human ancestors used to be written only in bones and tools, but since the 1960s DNA has given its own version of events. Some results were revelatory, such as when DNA studies showed that all modern humans descended from ancestors who lived in Africa more than 100,000 years ago. Others were baffling, suggesting that key events in human evolution happened at times that flatly contradicted the archaeology. 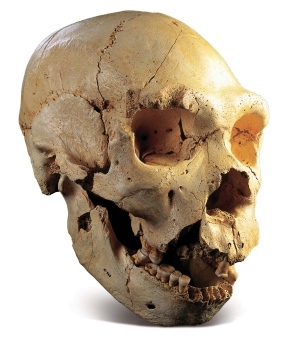 Take the 400,000–600,000-year-old Sima de Los Huesos site in Atapuerca, Spain, which yielded bones attributed to Homo heidelbergensis, the direct ancestors of Neanderthals. Genetic studies have suggested that earlier ancestors of Neanderthals split from the branch leading to modern humans much more recently, just 270,000–435,000 years ago. 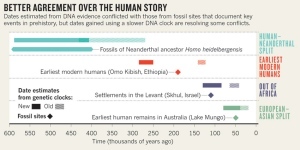 A slowed molecular clock pushes this back to a more comfortable 600,000 years ago (see ‘Better agreement over the human story’). Most of the genes long thought to be linked to in­tel­li­gence, simply aren’t, a new study has con­cluded. Nor do Chabris and his col­leagues de­ny that in­tel­li­gence is he­red­i­tary and ge­net­ic. But they say it now turns out that this in­tan­gi­ble qual­ity is probably too com­plex to sum up in a few genes. It may be some time be­fore re­search­ers can iden­ti­fy in­tel­li­gence’s spe­cif­ic ge­net­ic roots, say the re­search­ers, whose find­ings are pub­lished on­line in the re­search jour­nal Psy­cho­log­i­cal Sci­ence. Chabris and Da­vid Laib­son, a Har­vard econ­o­mist, led an in­tern­ati­onal team of re­search­ers that an­a­lyzed a doz­en genes us­ing large da­ta sets that in­clud­ed both in­tel­li­gence test­ing and ge­net­ic da­ta. 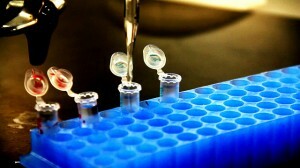 In nearly eve­ry case, the re­search­ers found that in­tel­li­gence could not be linked to the spe­cif­ic genes tested. “We only found one gene that ap­peared to be as­so­ci­at­ed with in­tel­li­gence, and it was a very small ef­fect. This does not mean in­tel­li­gence does not have a ge­net­ic com­po­nent. It means it’s a lot harder to find the par­tic­u­lar genes, or the par­tic­u­lar ge­net­ic vari­ants, that in­flu­ence the dif­fer­ences in in­tel­li­gence,” said Chabris. It had long been be­lieved, on the ba­sis of stud­ies of iden­ti­cal and fra­ter­nal twins, that in­tel­li­gence was a her­it­a­ble trait. The new re­search af­firms that conclusi­on. But old­er stud­ies that pick­ed out spe­cif­ic genes had flaws, Chabris said, pri­marily be­cause of tech­no­log­i­cal lim­its that pre­vented re­search­ers from prob­ing more than a few loc­ati­ons in the hu­man ge­nome to find genes that af­fect­ed in­tel­li­gence. Al­so, “at the time, it was be­lieved that in­di­vid­ual genes would have a much larg­er ef­fect — they were ex­pect­ing to find genes that might each ac­count for sev­er­al IQ points,” Chabris ex­plained. IQ is a wide­spread meas­ure of in­tel­li­gence in which av­er­age in­tel­li­gence is scored as 100, while high­er or low­er in­tel­li­gence are scored high­er or low­er. The score is meant to mea­sure a per­son’s in­tel­li­gence as com­pared to the av­er­age for their age group, as a per­cent­age. Chabris said additi­onal re­search is needed to de­ter­mine the ex­act role genes play in in­tel­li­gence. The possible quantum effect – the apparent imprinting of the DNA on the water – is not in itself the most contentious element of the experiment, so much as the relatively long timescales over which it appears to manifest itself. Quantum phenomena are assumed to show their faces in imperceptible fractions of a second and not seconds minutes and hours, and usually at very low temperatures approaching absolute zero.